The recent molasses spill in the Beas river that caused the death of thousands of aquatic fish in Punjab has highlighted the need to save the environment from pollution. Punjab Chief Minister Amarinder Singh has called upon industry to take appropriate steps to check the pollution caused by their factories but various organisations across the region including in Punjab and Chandigarh, have come forward with steps of their own to save the environment. The CM has said throwing of waste into the rivers by industry was not acceptable and it was their responsibility to control water pollution by ensuring that no untreated water or effluent is thrown into the rivers. Amarinder Singh also expressed serious concern about the pollution of rivers in cities, which he said needed to be stopped immediately. The spillage incident took place days before World Environment Day on 5 June. The government and private agencies working for the cause of the environment have now pledged to reduce the use of plastic under the theme ‘Beat Plastic Pollution’. In a step further, the Punjab Pollution Control Board (PPCB) has approached firms in Chennai, Bengaluru, Mumbai and Daman for supplying biodegradable carry bags to reduce the rampant use of polythene or plastic bags in the state.PPCB chairman Kahan Singh Pannu said after launching biodegradable carry bags from the Golden Temple in Amritsar, these carry bags have been delivered to all major cities and towns of Punjab offering the public a scientific and viable alternative to plastic carry bags. Pannu admitted, however, that though use of plastic carry bags is banned in the state, due to lack of a viable alternative, they are still rampant. Punjab State Council for Science and Technology in collaboration with Natural Biodiversity Society has started a series of events to make the public aware of how to reduce plastic use. Professor and Head of Botany Department at Panjab University, Amrik Singh Ahluwalia, told The Statesman that they have planned various activities to spread awareness to protect the environment. “It is the need of the hour that all of us make efforts to save the environment. We will continue the awareness campaigns throughout the year. The students of our department are enthusiastically participating in the awareness camps,” he said. He said the talk sessions were organised and separate teams were divided in two different groups. He said the cycling team identified agricultural fields and bushes around Sukhna catchment area where plastic waste was scattered all around. During the event held on 5 June in Chandigarh, Commanding Officer at Siachan, Dr Rajesh, also cited the example of Leh and Ladakh area where the locals are collecting plastic waste and disposing it in a scientific way. Professor and environmental scientist from Guru Nanak Dev University Amritsar Adarsh Pal Vig, during an event at Pushpa Gujral Science City in Kapurthala said India is projected to be the largest consumer market for plastic goods with a consumption of 12 million tonnes per annum, behind the US and China. He said the generation of plastic waste in India is estimated to be 15342.6 tonnes per day. He said plastic bags pose a serious threat to birds and marine animals that often ingest them as food. Plastic waste thrown into the ocean kills around one million sea creatures every year. At least 267 different marine species are known to have suffered from entanglement of plastic waste, he said. The major chemicals that go into the making of plastic are highly toxic and pose a serious threat to all living beings on the earth. Some of the constituents of plastic such as benzene are known to cause cancer and skin irritation in humans, he said. Vig also said that recycling of plastic (polymers) is a good idea but not always practical because many products contains dyes and other material which are difficult to separate. The most suitable, eco-friendly and inexpensive method involving biological activity for the polyethylene waste treatment, he added. 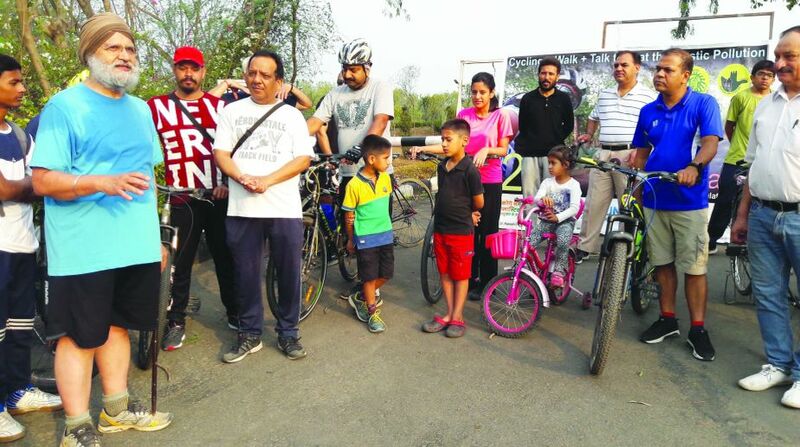 Meanwhile, the Punjab Amateur Rowing Association president Adaish Pratap Singh Kairon said they have launched a massive awareness campaign to motivate and educate people about the ill-effects of using plastic. Kairon said the awareness campaign will continue till 15 June. He said people living in slums and villages would also be educated and motivated against use of plastics.Kairon said it has often been observed that the waters of Sukhna Lake in Chandigarh gets polluted with the throwing of non-degradable pollutants like metals, plastics and other material causing great harm to the lake as well as the environs. The volunteers would also urge the general public to maintain the ecological balance in order to ensure environmental stability and also plant and protect more and more trees in their surroundings, he said. Kairon appealed to the people of Punjab and Chandigarh to take up these challenges and work together to make it a ‘people’s movement’ to create green, clean and healthy surroundings by renewing our resolve to preserve our natural resources.